Flattering A line skirt, with contrasting waist and hem binding, finished with french seams, and centre back zipper. 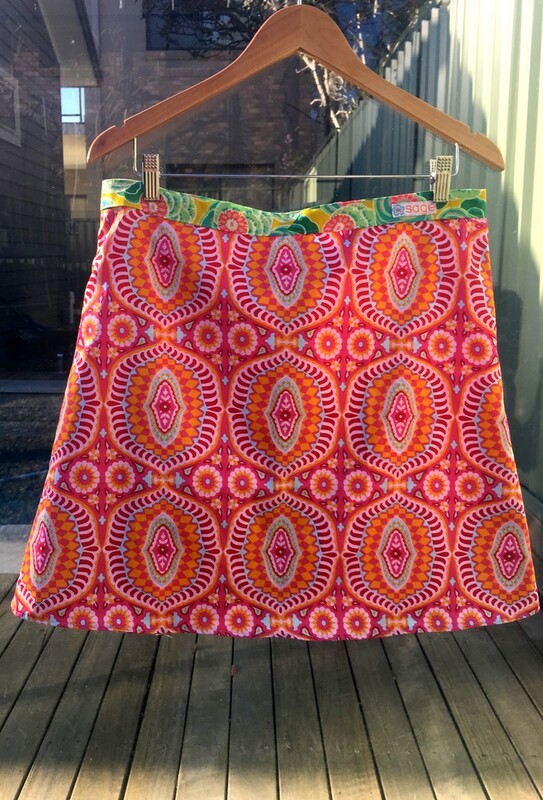 This stunning Amy Butler fabric, from her night music collection, makes for a perfect summer skirt. A gorgeous bohemian design in striking reds, pinks, orange and aqua. With a contrasting binding around the waist in another gorgeous Ay Butler fabric with a green and blue floral pattern on a mustard background. Easy and comfortable to wear, slip on a singlet and some thongs to stroll around the beach, or dress it up for a night out with friends. Made from 100% premium cotton fabrics. This is an average Australian size 12-14 made to sit on the lower waist. The bias binding around the waist gives it a small amount of stretch. The length is designed to sit above the knee on most, depending also on where the skirt sits around the waist.